"A very easy, versatile recipe of a pesto topping on French bread slices. One of my most requested recipes! Great for potlucks or as an accompaniment to soup or salad meals. Try them with sun-dried tomato pesto!" These were okay and received mixed reviews. They were not the fastest going appetizer and I had alot leftover, but they were really fast and easy to make. 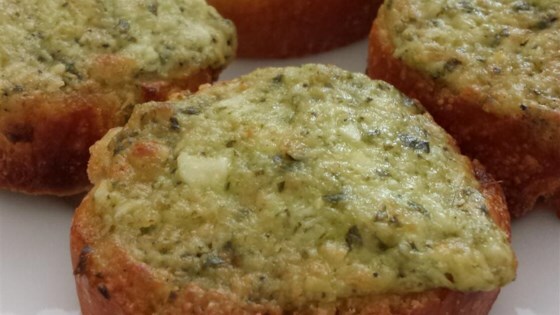 I tried it with precooked baguettes - the pesto rounds were absolutely delicious! they can be eaten with just about anything or just alone...excellent recipe! Excellent! Just watch them so they don't get too brown...the broil and bake times in the recipe were a little too long for my oven! This was very good. Followed the directions exactly. Big hit with my family. I loved this!! Will make these all the time, I'm sure.